ALLANTOIN – used for its moisturizing, softening and smoothing properties, alleviates irritations, accelerates skin repair and epidermal healing. CHLORELLA VULGARIS ALGAE – stimulate collagen and elastin synthesis, regenerate skin cells damaged by excessive sun exposure or wrinkles caused by facial expression. The algae reduce redness and puffiness under the eyes. ALGINATE – (100% brown algae extract) rich in amino acids, vitamins, micro and macro elements. It strengthens, intensely hydrates and nourishes the skin, has a stimulating effect on cell metabolism, reduces redness and irritations with the help of the following ingredients, which are very easily absorbed by the skin: 1. Alginates – which have a stimulating, regenerative, cleansing and moisturizing effect on the skin, 2. Macro elements – potassium, calcium, sodium, magnesium and silicone salts, 3. Microelements (iodine, manganese, zinc, iron, selenium salts) – are contained in vitamins, enzymes, and coenzymes and bioregulate some of the skin’s functions. LAMINARIA ALGAE – rich in minerals and Vitamins B, C, D and E, stimulate blood circulation and collagen synthesis in the skin, improving the skin’s flexibility and smoothness. The algae bind toxins and increase their elimination rate. Used for a softening, balancing and moisturizing effect on the skin. SPIRULINA ALGAE – the so-called „Green Gold”, natural source of Vitamin B1, B2, B6, B12 and E, chlorophyll and Beta-carotene, gamma linolenic acid, and a variety of micro and macro elements: iron, calcium, zinc, magnesium, selenium and potassium. ALOE – concentrated composition of vitamins, minerals, enzymes, polysaccharides, and amino acids from the leaf marrow originating from plants grown at ALOE BARBADENSIS, a certified cultivate. Aloe shows an extraordinary affinity to human skin. It sooths inflammations, boosts skin regeneration and wound healing. It stimulates new fibroblast divisions and collagen production, deeply moisturises the skin and improves the delivery of oxygen to skin cells. ANISE – has powerful relaxing properties, reduces expression lines and prevents the formation of new wrinkles. ARBUTIN – whitens the skin by inhibiting tyrosinase, an enzyme which catalyses the first stage of melanin synthesis. WATERMELON – rich in phosphorus, iron, potassium, B Vitamins, folic acid, Vitamin C, and beta-carotene. 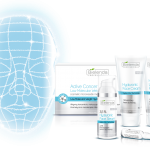 Prevents DNA fragmenta- tion in fibroblasts and keratinocytes, protects skin cells against the consequences of exposure to UV radiation, combats free radicals, and reduces the risk of skin redness after exposure. It soothes the skin and makes it uniquely delicate, stimulates blood and lymph microcirculation, helps eliminate toxins from the body, blocks enzymes responsible for carbohydrate metabolism into fatty tissue and speeds up fat burning. It soothes the skin and shapes the silhouette. ARGININE PCA – a component of the Natural Moisturizing Factor (NMF), intensively moisturizes the skin, stimulates cellular metabolism, and soothes irritations. BIO-BUSTYL® – stimulates collagen and elastin synthesis, inhibits skin pigmentation, strengthens the skin, prevents elasticity loss, firms and tones the epidermis. BIO-WHITE® – a complex of mulberry and heartleaf bergenia extracts – it inhibits skin pigmentation. BLACK COHOSH – an exotic plant which stimulates the production of tissue fibres supporting the skin which maintain the skin’s firmness and suppleness. BOSWELLIA SERRATA – used in Ayurvedic medicine for its unique antibacterial and soothing properties, effectively soothes and reduces irritations. It inhibits 5-lipoxygenase, the key enzyme responsible for inflammatory reactions, and thus reduces skin discomforts – ache, reddening, itching. BROWN SUGAR (MADE OF SUGARCANE) – effectively exfoliates dead skin cells, cleanses and soothes the skin. AMBER – a rich source of active ingredients which are essential to maintain good skin condition. It regenerates the skin, has a deep moisturizing effect, stimulates cutaneous metabolism, and scavenges free radicals. CENTELLA ASIATICA – stimulates cell regeneration, improves subcutaneous circulation, firms and smoothes the skin. defends it against adverse environmental factors. ZINC – prevents infections, reduces excessive sebum production. Alleviates skin irritation and inflammations. RED GRAPES – a rich source of natural polyphenols; used for a unique and powerful anti-oxidizing action, protect the skin against premature ageing and aggressive environmental pollu- tants. Deliver firming, detoxicating and irritation alleviating effects. D-PANTHENOL (Pro-Vitamin B5) – absorbs easily and deeply into the skin, stimulates cell divisions, heals microdamage to the epidermis, and regenerates the skin. Effectively moisturizes the skin and leaves it soft and supple. EASY – LIFT – a complex of plant polymers and an African dessert tree resin certified by ECOCERT provides for an instant lifting effect, smoothes out wrinkles and effectively improves the skin’s firmness. OLIVE LEAF EXTRACT – fights free radicals, stimulates the “youth enzyme” synthesis in fibroblasts, and protects skin cells against UVA radiation. MARSHMALLOW EXTRACT – moisturizes and optimally oils dry skin, accelerates the regeneration of epidermal microdamage. ELASTIN – is responsible for maintaining proper skin functions, boosts the skin’s elasticity and firmness. It also reinforces supportive fibres in the skin. EMBLICA – an Indian gooseberry – used in Ayurvedic medicine. It has natural anti-oxidizing and skin whitening action, and effectively eliminates pigmentation spots and freckles. Reduces the visibility of stretch marks, improves the skin’s condition. SOYA PHYTOSTEROL – regenerate the protective lipid barrier of the skin. GARCINIA CAMBOGIA – a priceless source of Hydroxy-Citric Acid (H.C.A.) which inhibits fat deposition in cells, it slims and shapes the silhouette. GINKO BILOBA – slows down skin ageing, hydrates the skin, and absorbs UV radiation. WHITE CLAY – it contains silicon, calcium, magnesium, iron, potassium and sodium, which soothe sensitive, dry, delicate and tired skin. GHASSOUL CLAY FROM MOROCCO – offers a natural richness of precious elements, such as silica (firms the epidermis), magnesium (slows down skin ageing), calcium (stimulates the skin’s natural resistance and alleviates irritations), and selenium (detoxifying effect). It has exceptional detoxicating and oxygenating effects. GREEN CLAY – it disinfects and effectively treats acne. It delivers skin care, regeneration and strengthening, nourishment and mineralization. POMEGRANATE – contains a highly concentrated dose of Vitamin C, Vitamin B, minerals and a richness of natural polyphenols scavenging free radicals. Used for its exceptional moisturizing, strengthening, anti-ageing and regenerating action on the epidermis. HYDROMANILTM – three-dimensional colloidal polysaccharide matrix made of Tara seeds, a plant originating from Peru. It gradually releases moisturizing agents of various sizes, which permeate into the deepest skin layers. This is why the hydrating effect lasts longer and balances the epidermal exfoliation process, leaving the corneal layer consistent and flexible, thereby improving the condition and appearance of the skin. COCOA SEEDS – a source of multiple minerals: iron, magnesium and calcium. It protects the skin against free radicals, nourishes, regenerates, alleviates irritations, and prevents skin dryness. Theobromine and theophiline contained in the cocoa seeds stimulate metabolism and fat burning, thereby reducing cellulite symptoms. CHESTNUT – has anti-inflammatory properties, makes the capillaries tighter and more flexible. Improves blood circulation in the skin and protects it against adverse UV radiation. Reduces swelling, reinforces blood vessels, thereby reducing reddening and puffiness under the eyes. CAVIAR – a rich source of proteins and Vitamins A, D, E and B, oligoelements and iodine, which are essential for proper tissue growth. Phospholipids and phosphorus contained in caviar stimulate epidermal regeneration. The caviar delivers a powerful moisturizing and firming effect. It improves the skin’s appearance and well being. CERATOLIN – gently eliminates dead epidermal cells, which makes the skin look younger and healthier. KIGELINE AFRICANA – an extract from an African plant known for its exceptional breast enlarging and firming properties. Improves skin suppleness and elasticity. Moisturises and exhibits anti-inflam- matory and antioxidant properties. COENZYME Q10 – oxygenates cells, neutralizes free radicals responsible for skin ageing. It stimulates cellular regeneration, effectively smoothes out wrinkles and prevents the formation of new lines. CAFFEINE – stimulates metabolism, reduces fatty tissue and cellulite, and activates fat burning. Boosts the skin’s suppleness and elasticity. Detoxifies the skin. MARINE COLLAGEN – has a strong moisturizing effect, conditions and regenerates the skin, restores the skin’s elasticity and firmness. It slows down the skin ageing process, and protects the skin against excessive water loss. COLLOIDAL GOLD – permeates through the epidermis and stimulates skin cell regeneration, boosts elastin and collagen production, firms, lifts and smoothes the skin, provides optimum moisturization and fights free radicals. Brightens the skin and improves the skin’s colour. CELLULITE CONTRA+ COMPLEX – (caffeine, ivy, algae, green coffee, Centella asiatica) stimulates microcirculation of blood and lymph, helps eliminate toxins from the body. Blocks enzymes responsible for carbohydrate metabolism into fatty tissue and speeds up fat burning. It soothes the skin and shapes the silhouette. SEA WATER CONCENTRATE – rich in micro and macro elements; revitalises, nourishes and energises the skin. SEA SAMPHIRE – used for its exceptional anti-oxidizing and cleansing properties. High content of flavonoids and minerals prevents the loss of skin’s firmness and the development of first wrinkles. It has balancing and anti-inflammatory properties. OAK BARK – has an astringent effect on the skin, tightens capillaries, and soothes skin inflammations. GOAT MILK – a natural rejuvenating agent, it nourishes and moisturises the skin, makes it exceptionally gentle, smooth and soft. It slows down skin ageing, improves the skin’s suppleness and helps maintain the natural pH level. Contains calcium, phosphorus, magnesium and zinc, Vitamins A, C and D.
CREATINE – revitalises, soothes irritations, moisturises, and protects the skin against adverse environmental conditions. GLYCOLIC (HYDROXYACETIC) ACID – one of alpha-hydroxy acids (AHA) naturally present in the environment. Glycolic acid is pro- duced from sugarcane juice. Its broad spectrum of action is combined with high effectiveness and used in the treatment of a variety of skin conditions. It offers powerful exfoliating properties to eliminate blackheads and to reduce the layer of the accumulated dead epidermal cells. Glycolic acid is commonly used in various skin-care products to boost the synthesis of collagen, elastin and glycosaminoglycans. It increases epidermal permeability, which improves the absorption of depigmenting agents and vitamins into the skin. HYALURONIC ACID – helps retain water in the epidermis (1g may retain ca. 6% of water), maintains relevant skin hydration, and protects the skin against the loss of elasticity. It penetrates into epidermal layer and expands to reduce wrinkles from the inside; firms and smoothes the skin. It is applied as a natural filter that protects the corneal layer of the epidermis. LACTOBIONIC ACID – a new generation polyhydroxy acid (PHA). It gentry exfoliates surface and cornified cells, thereby stimulating the skin’s regeneration process. It boosts water retention in the epidermis to support its protective barrier. Stimulates fibro- blasts to produce collagen fibres, prevents teleangiectasia, and improves the flexibility of capillaries. It is a powerful antioxidant. MANDELIC ACID – with its unique molecular structure, mandelic acid provides gentle and safe exfoliation which activates cell divisions in the epidermis. It balances the epidermal structure and increases the structure of deeper epidermal layers. Mandelic acid is one of alpha-hydroxy acids extracted from bitter almonds in a hydrolysis reaction. It has exceptional antibacterial properties and provides optimum care for oily and acne-prone skin. It brightens discolorations and balances the skin’s colour. Mandelic acid stimulates the synthesis of collagen and elastin, which improves the skin’s elasticity. Exfoliation with mandelic acid can be used in any skin types or skin conditions. The acid is well tolerated, it causes no skin redness during the treatment, and the patient can only experience a weak itching sensation. LACTIC ACID – used for its powerful moisturizing properties, balances epidermal exfoliation and removes dead cell layers. It stimulates ceramide production in the skin, thereby improving the tightness of epidermal lipid barrier and limits water loss from the skin. It also prevents clogging of sebaceous glands and has antibacterial action, therefore prevents the formation of inflamma- tory lesions. SALICYLIC ACID – one of B-hydroxy acids, balances skin regenera- tion, gently exfoliates the epidermis by reducing intercellular bindings, removes excessive layers of cornified epidermal cells. It has bacteriostatic and fungicidal properties, and reduces un- pleasant odour. It also helps remove excessively thickened cornified layer of the skin. LANOLIN – forms a film on the skin surface that protects it against excessive water loss. It smoothes the epidermis and reduces skin roughness. Penetrates deep into the skin and acts as a lubricant in microdamage of the cornified layer of the epidermis. LIME – contains vitamin C, potassium, copper and flavonoids; it cleanses and refreshes the skin, and is used for its antibacterial and aromatic properties. L-CARNITINE – stimulates fat burning and prevents fat tissue concentration; accelerates skin regeneration. COCOA BUTTER – a natural source of vitamins, micro elements and antioxidants. Effectively soothes irritations. Regenerates, moisturises and protects the epidermis as it contains oleic acid. Leaves the skin bright and smooth. SHEA BUTTER (KARITE) – a natural UV filter protects the skin against the harmful effects of sun exposure and adverse environmental factors. It reinforces, nourishes and regenerates the epidermis, and prevents it against dryness. MICELLES – microscopic particles that effectively capture and remove impurities from the skin surface. Micelles help carry vitamins, minerals and plant extracts, support cutaneous delivery of cosmetic ingredients. FINE-GROUND COCONUT PARTICLES – remove dead epidermal cells, smooth the skin and prepare it for the absorption of active substances. SPATIAL SILICONE MICROPARTICLES – mattify the skin; conceal skin imperfections and fine wrinkles. MICROCOLLAGEN – improves the skin structure and elasticity, helps maintain its suppleness. Reduces wrinkles and expression lines from the inside. Corrects facial lines by reinforcing weakened collagen fibres in ageing or dehydrated skin. Firms and tones the epidermis, and balances skin moisturization. JOJOBA MICROPARTICLES – remove dead epithelial cells during skin massage, and permeate into the skin when melted. Jojoba contains plant wax which supports the lipid layer of intercellular cement. MICRONIZED CANADIAN CRANBERRY FRUIT – natural source of Omega-3 and Omega-6 fatty acids, polyphenols, tocotrienols, and antibacterial tannins. HYALURONIC ACID MICROSPHERES – help boost the volume of upper skin layers. While used in biotechnical processes, the particles of hyaluronic acid are dehydrated, which means they permeate more easily into upper epidermal layers, where they expand by 30-fold. As a result, they absorb water, filling out tissues from the inside. Hyaluronic acid microspheres provide optimum skin hydration, suppleness and smoothness. SEA PROTEIN MICROSPHERES – penetrate into the epidermis, expand to reduce wrinkles from the inside; firm and smooth the skin. MINERAL CAPSULES – warm up the skin, open pores and prepare the skin for intensive cleansing. UREA – a component of NMF which intensively moisturizes and softens the skin, exfoliates it and improves the permeability of its cornified layer to improve transdermal absorption of active ingredients deep into the skin. FUCUS – contains iodine, mannitol, fucoxanthin, bromine, alginic acid, laminarin, fucoidin, and a variety of vitamins (B1, B2, C, D, E, H, K, folic acid) and micro elements (iron, manganese, cobalt). Improves the skin’s appearance, firmness and elasticity, stimulates its regeneration, restores natural pH levels, balances sebum secretion, removes toxins, moisturizes and smoothes the skin surface. Helps reduce body fat. ARGAN NANOEMUSION – exclusive oil made of Argan, a species of tree growing in Morocco, which have been used in beauty treatment for centuries and are rich in polyphenols and Omega-6 fatty acids. It stimulates the skin regeneration, revitalises, nourishes and rejuvenates the skin. NIACINAMIDE PC – a safe type of Vitamin B3 – fights skin problems – acne, spots, reddening, roughness and inflammations. Reduces excessive sebum production, mattifies the skin. It has a matting effect on the skin. Reduces water loss, regulates epidermal regeneration, and stimulates collagen production in fibroblasts. Niacinamide PC is a powerful antioxidant that prevents the production of free radicals and protects the skin against UV radiation. It strengthens the skin and improves its resistance to damage. It brightens the skin by inhibiting the transfer of melanosomes to keranocytes, reduces pigmentation sports, sun discolo- rations, as well as age-related discolorations. ARGAN OIL – the most exclusive oil in the world, the so-called Moroccan Gold. Rich in Vitamin E, polyphenols, Omega-6 acids, a perfect component of an Anti-Age diet. Stimulates skin regeneration, revitalizes and rejuvenates the skin, and prevents irritations. AVOCADO OIL – a natural UV filter, a rich source of vitamins, unsaturated fatty acids and antioxidants, shows biocompatibility with human skin and offers exceptional regenerating and softening properties. Effectively prevents excessive water loss and delivers a deep skin moisturising effect. BABASSU OIL – softens the skin, makes it delicate and protects it against adverse environmental factors. CAROTENE OIL – provides skin tensioning, soothing and balancing effect, stimulates cell divisions, oxygenates the skin, and fights free radicals. KUKUI OIL – softens the epidermis, alleviates irritations and improves the skin’s immunity. PERLILLA OIL – firms the skin and shapes silhouette. It slims the body and effectively reduces cellulite. GRAPEFRUIT OIL – supports epidermal growth and regeneration, reinforces, nourishes and tones the skin, cleanses and contracts skin pores, has antiseptic effect, refreshes, invigorates and balances the skin, reduces wrinkle formation. ORANGE OIL – balances and cleanses the epidermis, used in aromatherapy. GRAPE OIL – is well absorbed by the epidermis, balances, protects and soothes the skin, supports the epidermal barrier, prevents water loss, moisturizes and softens the skin. Contains polyphenols that protect the skin against free radicals and adverse environmen- tal factors. SWEAT ALMOND OIL – one of the best oils used in cosmetology. Effectively softens and smoothes the epidermis; nourishes and reinforces the protective hydrolipid film. It contains large quantities of linoleic acid, which supports the functioning of the intercellular cement in the corneal epidermal layer. CACAO OIL – smoothes and softens the skin, improves microcircu- lation, has relaxing effect by stimulating the production of endor- phins, the hormones of happiness. MAKADAMIA OIL – a natural source of Vitamin F, nourishes the skin, provides a gentle skin oiling, prevents the loss of moisture and reduces the adverse impact of environmental factors. PASSIFLORA OIL – used for its exceptionally effective cleansing, nourishing and firming properties. It relieves irritations, calms and soothes all skin types, especially couperose skin. LAVENDER OIL – prevents bacterial infections and improves circulation. ORGANIC COCONUT OIL certified by ECOCERT – a rich source of saturated fatty acids offering powerful regenerating, moisturizing and smoothing properties. MACADAMIA NUTS – fine-ground particles remove dead epi- dermal cells, smooth the skin and prepare it for the absorption of active substances. PLANT PLACENTA – improves skin colour and tone, visibly reduces wrinkles and makes the skin look younger. PLATINUM – rejuvenates the skin. Reduces wrinkles and lines occurring as a result of skin ageing, tiredness and stress. SILK PROTEINS – protect the skin against adverse effects of environmental factors; a micro-cocoon made of fibroin (silk protein) effectively maintains epidermal water balance and helps keep optimum skin hydration and elasticity. Make the skin satin smooth and soft. Create a protective film on the skin, thereby preventing water loss. MILK PROTEINS – their composition is almost identical to that of the Natural Moisturizing Factor (NMF) of human skin, which guarantees optimum skin hydration. Proteins lift the skin and improve its flexibility and general condition. PUMICE – solidified frothy lava, a natural richness of silicon, effectively removes dead epidermal cells, exfoliates and polishes the skim, and leaves the skin on foot gentle, smooth and healthy looking. VITAMIN A OF PLANT ORIGIN – stimulates the recovery of epidermal cells, improves the skin’s elasticity, prevents or reduces wrinkles (CLINICALLY CONFIRMED ACTION). CHAMOMILE – soothes irritations, prevents infections, and balances the skin. RUTIN – reduces vulnerability of capillaries, which are reinforced and protected. Improves permeability of blood vessels. Prevents skin ageing due to strong anti-oxidative action. HORSETAIL – rich in easily absorbed silica, strengthens nail plates. SOOTHEX – used for its unique antibacterial and soothing properties, effectively reduces irritations. Inhibits 5-lipoxygenase, the key determinant for inflammatory reactions. NATURAL SALT – rich in micro and macro elements. POWDERED PEARL – delivers skin nourishing and conditioning properties, slows down skin ageing. A source of precious amino acids essential for the proper functioning of the skin. Leaves the skin under the eyes radiant and illuminated. SPF 10 – prevents skin discolorations, protects tissue damage from UVA and UVB radiation. POWDERED DIAMOND – firms and tones the skin and provides an instant lifting effect. Regenerates and smoothes the epidermis, reduces wrinkles and prevents skin ageing. TAURIN – stimulates collagen production, prevents skin ageing, and regenerates the epidermis. TROXERUTIN – reduces vulnerability of capillaries, which are reinforced and protected. An active antioxidant. VITAMIN B3 – Niacinamide PC, strengthens the skin and improves its resistance to damage. Reduces all skin imperfections caused by acne. It has a skin matting effect. VITAMIN B5 – moisturizes and softens the epidermis, stimulates its regeneration, improves the skin’s condition. VITAMIN C – a powerful antioxidant that protects the skin against free radicals, improves mechanical resistance of capillary walls, reduces discolorations. Boosts blood microcirculation and stimu- lates collagen synthesis. Protects the skin against infections and discolorations. VITAMIN E – slows down the skin ageing process, smoothes and softens the skin, alleviates inflammations, reduces the adverse impact of sun exposure. Improves the skin condition and flexibility, restores its vitality and energy. VITAMIN F – improves the condition of skin and nails, accelerates skin regeneration. Restores the protective lipid barrier of the skin. GREEN TEA – a rich source of antioxidants; it has regenerating, toning, bactericidal, anti-inflammatory and antitoxic properties. Contracts dilated pores. Protects the skin against free radicals and stimulates skin cell regeneration. An active ingredient of confirmed slimming properties, stimulates fat burning. Its effects are visible for many hours after application. GREEN APPLE – provides intensive moisturization, protects the skin against free radicals and slows down skin ageing. GOLDEN PALM OIL – luxurious oil delivering a stimulating, ba- lancing, soothing, anti-inflammatory and protective action. It im- proves the natural skin colour. GINSENG – regenerates and rejuvenates the skin, delivers anti- oxidative effect, contains micro- and macro elements, trace elements and vitamins.